For thirteen years I single-parented my son, Thomas, who was diagnosed with Asperger’s syndrome when he was four. Now Thomas is a 21-year-old college student. As I look back on our journey together, I can’t help but realize the progress we’ve made. Single parenting a special needs child was difficult at times. I discovered that having a child with an Autism Spectrum Disorder (ASD), my decision to divorce became substantially more complex. My ex-husband and I sought out weekly family counseling. We both understood that we were struggling during that transitional time, almost as much as Thomas. I remember asking for assistance at times from family and friends. I took comfort in knowing I was doing the best I could do at any given time. When your marriage ends, it’s common to feel a number of emotions. Guilt, depression, anger, or even relief. Allow yourself to feel all of these emotions. It takes time to heal. You’ve made a life-altering decision that affects you, your spouse and your child or children. Ending your relationship is a major loss, and it’s a process to cope with this loss. You may experience grief. And as difficult as it may seem, once you accept this transition you will understand that your responsibilities are changing, and find the confidence in yourself as a single parent. Embrace new possibilities for personal growth. Trust yourself. Surround yourself with friends and family who support your decision. It’s a new beginning for you and your child. Move forward. An optimistic view is important. Connect with like-minded parents who will provide you with support, encouragement and help when you need it. 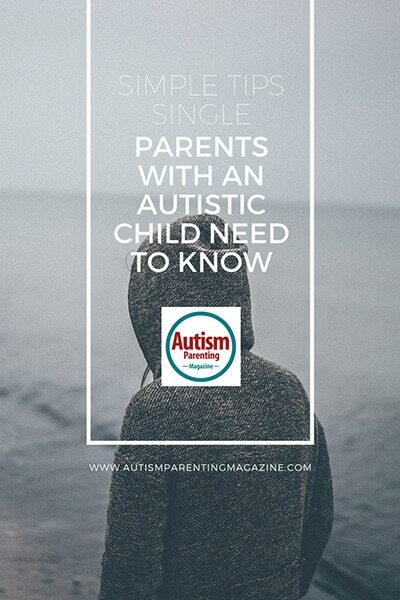 Single parenting a child with ASD can be isolating at times. Find support in your community; reach out to other single parents with special needs kids. Ask them about their strategies, and what’s been successful for them and their child. Join an ASD support group. And if there is not one, create one. That’s what I did. I went to our local bookstore, told them I wanted to hold a monthly meeting and they agreed. We met there for eight years, where I had guest speakers every month who were experienced in the field of autism. Although divorce is a difficult decision, single parenting is doable. It really is. Go for a walk, get a massage, sleep. It’s ok to rejuvenate yourself to be a better parent. It’s important do things for yourself in addition to your ASD child. Cook less, clean less, and live on less income. Don’t try to be the perfect parent. I did all of these things. It released so much pressure I’d put on myself when I first became a single parent. Involve friends and family. Create a Grandparents Day for your child to share. Be willing to ask for help and accept when you need it. For example, trade carpooling with another parent. Choose a day of the week to spend with your child and let him/her plan the day. Like a movie day, a special restaurant meal or take them to pick out a new book from your local book store. 5. Create a new budget. Make a list of your needs and wants and prioritize your list. For example, need: speech therapy, social skills group, occupational therapy, Wants: assistive technology, special interest books, or any extracurricular activity like soccer or art class. Karra Barber-Wada is the author of Plan B, Empowering the Single Parent to Benefit their Child with Autism, The Social and Life Skills MeNu for Adolescents on the Autism Spectrum, Living Your Best Life with Asperger’s Syndrome. She’s also published articles in the Autism Asperger’s Digest, TAP as well as AS Quarterly. She’s an advocate for her son with AS and lives in Northern California with her husband and three children. Very good advice. Family and Friends support is very important. Unfortunately, that doesn’t happen in most case . But, hopefully ,through educating society on Autism spectrums. Parents will gain more support. Thank you, for your services. Choosing to divorce your non-abusive spouse does not make you a single parent. Half of the “help” you offer in this article is NOT available to single / abandoned/fleeing single parents. When a parent of a special needs child divorces or separates from their partner, they indeed become s single parent. I was fortunate, in the beginning of our separation, to establish ground rules about our son, e.g. visitation, financial support etc. We were able to discuss decisions that would have the best outcome for our son- our goal. In the event that your divorce is not civil, and your husband/partner is absent, the challenge becomes more difficult. But – that when you ask for support from friends, family, teachers and others who are in similar situations. Join a support group and meet with like minded parents. You will be pleasantly surprised by the support you received.